Favorite Super Heroes are convening throughout Hollywood Land in Disney California Adventure® Park! Now is the time to suit up and mingle with some of the mightiest heroes to ever protect the universe. 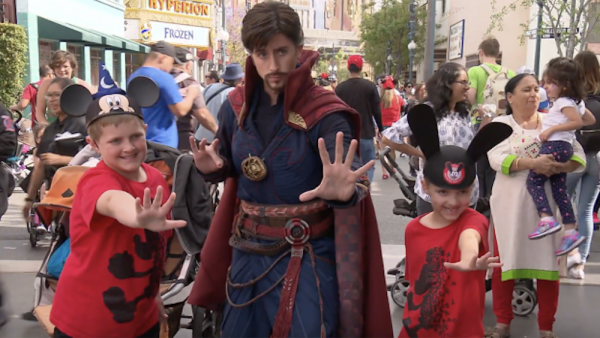 Doctor Strange is now appearing for the first time at the Disneyland Resort. The Master of the Mystic Arts acts as an intermediary between the real world and what lies beyond, traveling great distances in an instant! And throughout the summer, you can catch more heroes throughout Hollywood Land for a limited time, including Black Panther, Black Widow, Captain America, Spider-Man, Loki, Thor and Gamora. They have teamed up to meet with their newest “recruits” for the ultimate heroic encounter! To book your Disneyland Vacation, call 855-434-9397 or request a quote online! This entry was posted on June 4, 2018 at 3:02 pm and is filed under Disney News, Disney Vacation Planning, Disneyland. You can follow any responses to this entry through the RSS 2.0 feed. You can leave a response or trackback from your own site.